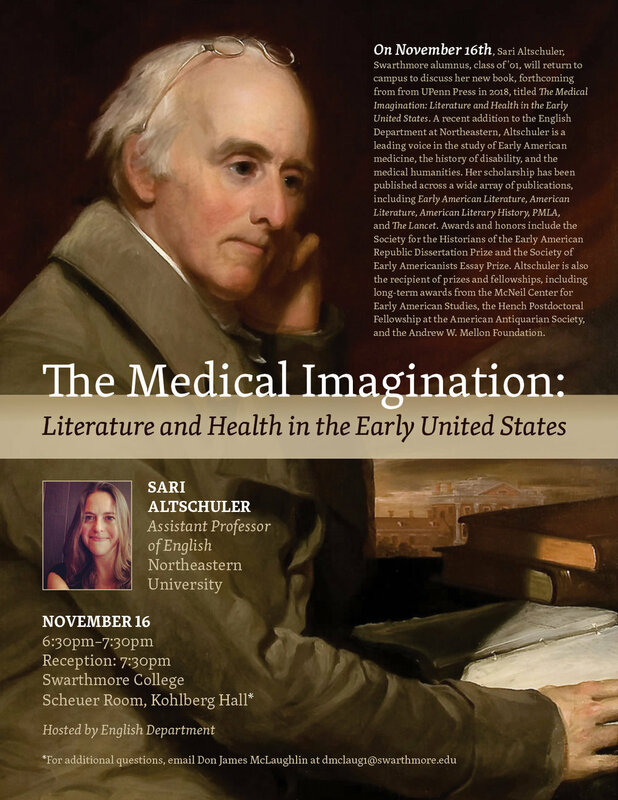 On Thursday, November 16th, at Swarthmore College, former MCEAS fellow and Assistant Professor of English at Northeastern University Sari Altschuler will be giving a talk on her soon-to-be-released first book The Medical Imagination: Literature and Health in the Early United States (Penn Press 2018) from 6:30pm-7:30pm in the Scheuer Room at Kohlberg Hall. A modest reception will follow. Over the last several years, Sari Altschuler has become a leading voice in the study of Early American medicine, the history of disability, and the medical humanities. Her scholarship has been published across a wide array of publications, including Early American Literature, American Literature, American Literary History, PMLA, and The Lancet. Awards and honors include the Society for the Historians of the Early American Republic Dissertation Prize and the Society of Early Americanists Essay Prize. Altschuler is also the recipient of prizes and fellowships, including the Hench Postdoctoral Fellowship at the American Antiquarian Society, as well as long-term awards from the McNeil Center for Early American Studies and the Andrew W. Mellon Foundation. In addition to being so influential and accomplished, Sari is known for being a very kind and generous colleague. Swarthmore is easily accessible by SEPTA Regional Rail, from 30th Street Station (or Suburban or 49th Street Station) on the Media/Elwyn line. Please be in touch if you have questions! The Free Library will be hosting one more LGBTQ Pride event next Wednesday, June 21st, 4:00-7:00 p.m. at their main location, Parkway Central (1901 Vine Street) . Titled "The Secret Life of Conversion Therapy," the event will combine autobiographical perspective, a short film screening, and historical context to raise awareness around the state of conversion therapy in the U.S. today, and a sense of how that practice has evolved over time. We'll conclude the event with a talk and Q&A by La Salle University doctoral candidate in psychology, Wil Skelton, whose personal experience and professional work have cultivated a nuanced, on-the-ground perspective as to why people enter these therapeutic relationships (on both sides) and what the lasting repercussions can be. Feel free to get in touch if you have questions or feedback afterward. This June, I will be coordinating LGBTQ Pride events at the Free Library of Philadelphia. Our first event will be this Saturday, June 10th. Following a screening of "Brother Outsider," we'll be joined via Skype by Assistant Professor of English at Willamette University Omari Weekes for a brief talk and Q&A. See the flyer attached for additional details!